Many nations have always considered the horseshoe a lucky charm: it is often nailed above the door or, as a tiny replica, carried around as an amulet. The belief in the magical properties of the horseshoe originated in the Middle Ages when the production of horseshoes was very costly and thus simply finding a horseshoe constituted a lucky break. Folklore research suggests that the rich symbolism pertaining to the horseshoe is related to its crescent shape (symbolic of the pagan moon goddess), and the material of which it is made, iron, which was believed to possess particularly strong ability to ward off witches and demons. Blacksmiths were also considered to have supernatural powers because they knew how to process iron. Finally, the horse is a much loved and even venerated animal in most cultures as a symbolic embodiment of power and vitality. As for good fortune, it is brought only by a horseshoe that has been found instead of bought and it must have been already worn by a horse. Nailed to the door or threshold of a house it will bring money and protect the household from evil forces and thieves; nailed to the door of the barn it will make sure that cattle grow well and bring profit. There is no unanimity regarding the way the horseshoe should be fastened to the door: with the ends facing up to prevent the good fortune from flowing out or down to facilitate the flow of good fortune into the house. Both views are present in the Latvian tradition: if the ends of the horseshoe face upward, good fortune will arrive from the heavens, if they face downward, it will flow up from the earth. The special circulation coins have been struck to represent both beliefs, so that they bring good fortune to everyone. 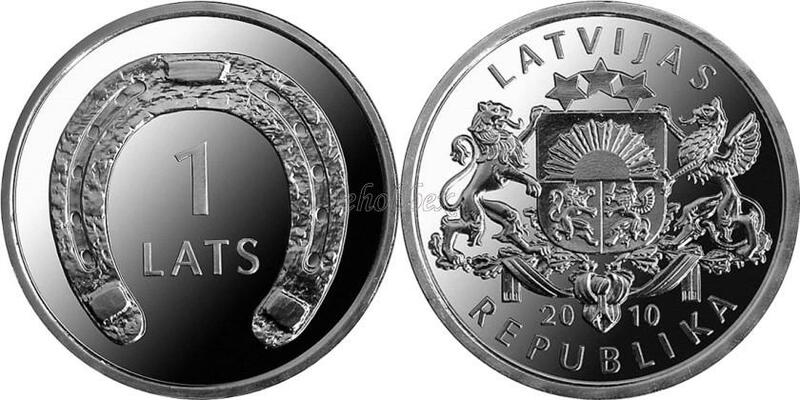 The large coat of arms of the Republic of Latvia, with the year 2010 inscribed below, is placed in the centre. The inscriptions LATVIJAS and REPUBLIKA, each arranged in a semicircle, are above and beneath the central motif respectively. A horseshoe with the ends pointing downwards encloses the numeral 1 in the centre and the inscription LATS beneath it.